We are six weeks into the 2005/06 school year and it has been almost four week since my last podcast so I wanted to give a quick report on how some of the projects are coming along. Our social studies department here at South Valley Jr High has purchased i-River MP3 players to use for instruction, I have recorded a study cast for my students to help them review, plans are underway for a podcast with a local politican and we are planning a community technology night at our school for November. 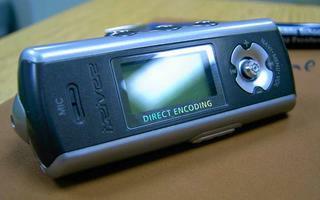 I also share a new educational technology podcast that has a focus on handhelds in the classroom. Last night I found a blog report that states there is little, if any, damage to the D Day Museum in New Orleans. Another link cites a report from the Associated Press that says the building is in good shape. Yesterday I was tracking down rumors that the museum was heavily damaged by looters and vandalsim. Great news, and right now we'll take any glimmer of good news we can get from this region. Our thoughts and prayers are with all those who have suffered so heavily due to hurricane Katrinia. The loss of human life is more important than any material possessions but as the city begins to evaluate its damage, the condition of the D Day Museum in New Orleans will be awaited by historians all over the world. In the podcast yesterday I mentioned that I was curious about the condition of the museum. I was able to find a blog entry with comments about its condition. There are reports that the museum fared well in the initial storm, but was damaged by looting and vandalism. The loss of this great museum to the ravages of nature would be tragic but understandable. If reports of serve looting and vandalism are true this is more than sad. 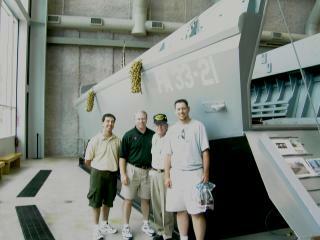 I have included a picture from my visit to the D Day Museum in July of 2004. I am standing in front of one of the Higgins boats used in the invasion along with other teachers from the district where I teach. We were attending the 2004 NECC conference. The older gentleman in the picture is a veteran who landing at D Day in the early waves. We talked with this gentleman and had him sign a copy of the "Order of the Day". I have the copy framed and it hangs next to the American flag which hangs in my classroom. Memories of a great day in a museum that seemed more like a cathedral honoring the memory of great men who gave their life for my freedom. Hello and welcome back after a break of about three weeks. School is back in session and things are getting back in the routine of early mornings, the flow of the school day and keeping up with grading. This week I'll share some thoughts on New Orleans, which educational podcasts I'm currently listening to, parent e-mail newsletters and a "StudyCast".